Wow. 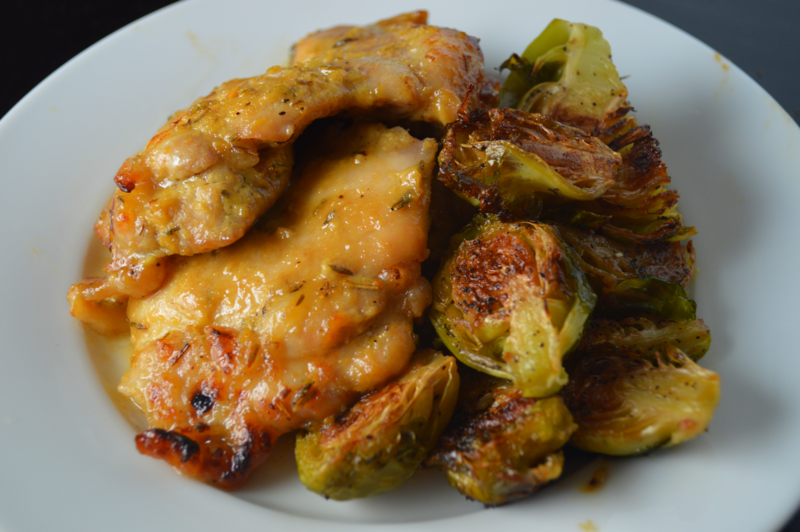 Dijon + Maple + Chicken Thighs = a heavenly smelling kitchen. It also creates a dish packed with flavor. I typically like to bake chicken thighs with a drizzle of olive oil and a dry rub because I like how caramelized the chicken gets. However, a traditional marinade keeps the chicken very juicy. So, I decided to give it a try. I combined maple syrup with Dijon mustard, thyme, and rosemary for a sweet and savory marinade. I baked the chicken in the marinade for about 40 minutes. Then, to get the caramelization that I love, I popped the chicken under the broiler for a couple of minutes. Stir together maple syrup, Dijon, thyme, and rosemary in a small bowl. In a foil lined 9×13 baking dish, add the chicken thighs and season with salt and pepper. Pour the sauce over the chicken thighs and flip to make sure they are coated. Flip and bake for 20 more. You want to bake them until they are cooked through to 165 degrees. Set the broiler to high. Broil chicken for 1-2 minutes on each side to get a nice caramelization.